The official presentation of the updated model Toyota Supra was held in 2019 January 14 in Detroit. The new 2018-2020 Supra is a two-door sports coupe. This is the 5th generation of the sports car. The Supra car will again appear on the roads in an updated form after a 17-year vacation. After all, it was in 2002 that the last car of the model Toyota Supra A80 4th generation came out. Then about the restoration of production was not the question. On the exterior of the new Toyota. For such a long period, the updated version of the Toyota Supra 2019-2020 pleased the audience with its external modern look. Changes can be traced dramatically. But it should be noted that the platform and style of this sports car remained the same. The car is designed for two passengers. Therefore, it has only two doors. To find out what updates the new model has received, let’s analyze its appearance, interior and technical characteristics. The front of the novelty emphasizes a completely new optics. In the headlights mounted lenses. L-shaped daytime running lights at the base with LEDs are used. The grille, as in the previous version, is absent. Instead of the grille, there is a continuation of the hood with a fixed Toyota nameplate. Sports car has a kit. In the construction of which there are three sections with mesh filling. Immediately under the headlights in the design of the bumper are aerodynamic openings. Their purpose is to increase the efficiency of air exhaust from the wheels. The platform was based on the latest version of the BMW Z4 sports car. Profile of the new Supra looks no worse than the front end. Instead of stylish and small side mirrors, the novelty is complemented by modern and comfortable mirrors. They have a special aerodynamic design. The base of the mirrors is painted black. In the previous version of the mirror had the color of the car body. In the basic configuration of the new mirrors will be complemented by options such as light repeaters with LED optics. Also electric drive for adjustment. Additionally, you can add to the existing configuration some options. Heated and automatic folding side mirrors during parking. The Japanese company Toyota will offer a new model of Supra in 6 types of colors. Feed news also has an attractive appearance. First of all, the non-standard boot lid catches the eye. She received the name «duck tail.» The massive bumper is located all over the rear of the car. The trunk lid of the elongated shape plays the role of a spoiler. Affects positively on the aerodynamic properties of the sports car. Rear optics implemented on the LED elements. They are designed not only to improve the efficiency of lighting. But also reduce power consumption. On the rear bumper has a groove with stamping for the license plate and rear view camera. The rear view camera is available in all trim levels of the sports car. The lower part of the bumper is complemented by a splitter. It has red fog lights with foot repeaters. The back of the new items are also emphasized by two chromeplated tips of exhaust pipes. In addition to the modified front and rear, you should also note the roof of the Supra 2019 sports coupe. If in the previous version the roof had a solid shape. So in the novelty it consists of two convex parts on the sides and with narrowing in the center. Due to this design to implement the installation of the sunroof failed. However, such goals were not set. Toyota sports car fans have long lost faith in the resumption of the Supra production line. Only 17 years later, it still happened. Considered multiple design changes for the better. There is no doubt gaining popularity. Increase sales of this model. Has the interior of the new Supra 2019 changed a lot? If the exterior of the car is made in strict Japanese style. That salon is completely copied from the 2018 BMW Z4. Differences from the Bavarian sports car are available. But they are insignificant. On the dashboard in the center is a multimedia touchscreen display. Its size is 12.3 inches. The console is slightly deployed to the driver. In the center is the control panel audio and climate control. On the steering wheel control buttons are located. They enhance driving. The central console has a wide structure with different secret sections. Decorates the console shift lever. Its form is completely copied from the BMW Z4. It is interesting! The control panel on the new Toyota Supra is completely electronic. Consists of 8-inch display. This is actually not surprising for a modern sports car. Salon is designed for landing two people. Therefore, there are two chairs with wide and high backs. The back has an electromechanical adjustment. Also comfortable projections on the sides as support. With the quality of plating everything is in order. Since already in the initial configuration there is a combination of leather with Alcantara. And the salon will be presented in four colors — black, red, brown, white. In addition, you can equip the interior with inserts around the perimeter of aluminum or carbon. On the technical characteristics of new items. Power equipment of the new Toyota Supra is also borrowed from the Bavarian model BMW Z4. It is worth more to know the technical characteristics of the new model. Under the hood will be placed 6-cylinder turbo engine of 3 liters. 335 hp The torque in this case is 495 Nm. As in the previous configuration, the novelty has rear-wheel drive. Like all racing cars. The suspension is also borrowed from the Bavarian counterpart. Implemented on MacPherson racks in front and multi-link suspension with 5 levers. To enhance comfort, the suspension is connected to the cabin through adaptive shock absorbers and original springs. The suspension has undergone refinement. This revision touched mounts. For this purpose, aluminum parts are used in the construction of the suspension. In addition to the stabilizer, for the production of which used heavy-duty steel. The total weight of the novelty, despite serious improvements and processing, is 1,540 kg. To connect a powerful engine with the rear wheels, a robotic transmission with 8-speed is used. Through this connection, the sports car develops speed from 0 to 100 km / h in just 4.1 seconds. 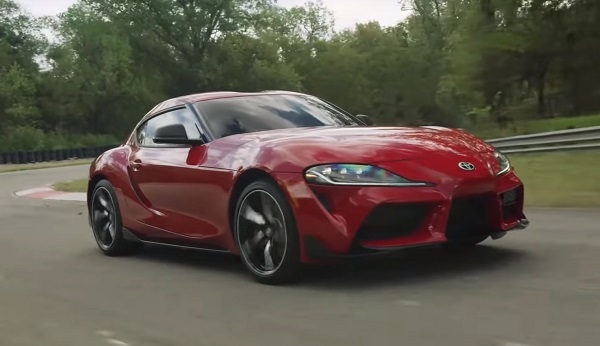 The maximum developed speed of the new 2019 Supra is 250 km / h. This rate is limited only by electronics. It is worth noting the presence of a differential, equipped with the option of locking. That allows the rear wheels to rotate at the same speed. On prices and trim levels. The manufacturer has officially announced that the new product will be presented in three trim levels — basic or standard. Also Premium and Launch Edition. How much will each grade. This is one of the most popular questions. The basic assembly will leave the cabin for 50 thousand dollars. Premium and launch will not cost much more — their price is 54 and 55 thousand dollars. 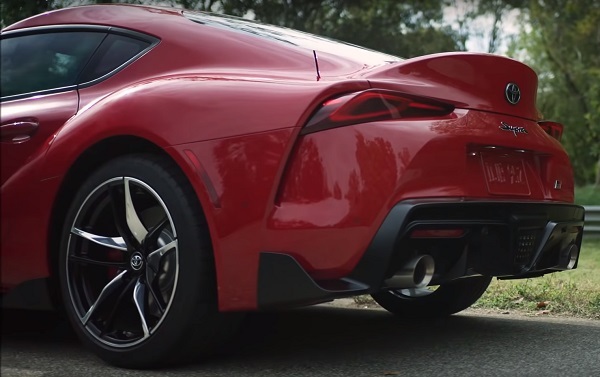 We recommend to view: video review of the new Toyota Supra. « New KIA Sorento 2019.